Why do we count sheep to fall asleep? It’s a question that we’ve pondered quite often. Is it because of the cute little “baa” sound that they make? Or maybe it’s because of that coat of soft, huggable wool that covers their entire body. Perhaps it’s because they have an adorable way of hopping over a fence in your imagination. We’re not quite sure, but for whatever reason, sheep have been eternally intertwined with our idea of sleep! So, let’s take that one step further! If counting sheep helps you get to sleep, then dressing up like one should really help you drift off into dreamland. 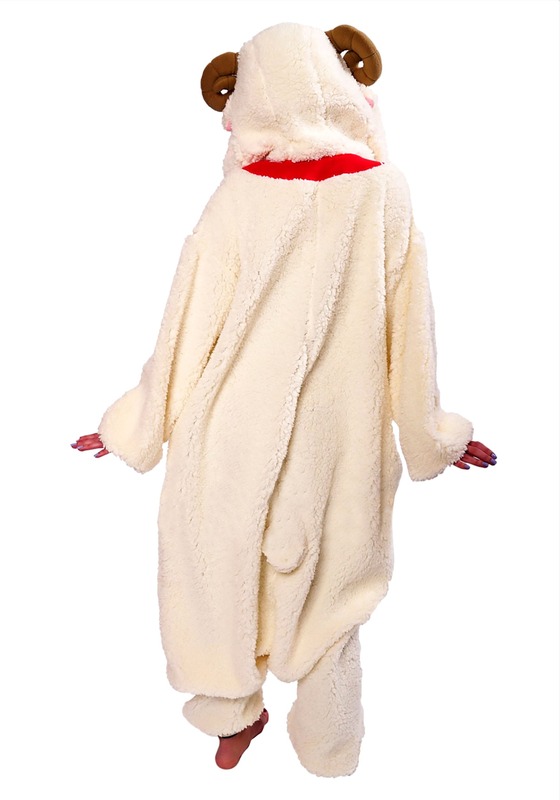 It just so happens that we’re the experts when it comes to dressing up like your favorite animals, so look no further than this ultra-cozy sheep kigurumi! This adult sheep kigurumi is a Japanese-style pajama costume that’s designed for maximum comfort. It’s a soft fleece material that fits with buttons along the front. The exterior has a faux sheep’s wool feel and the back of the jumpsuit even has a little stuffed tail in back. The hood fits quite nicely over your head when you want to go full-on sheep! A pair of cute little eyes are on top and the sides even have some curled brown plush horns. For added adorability, the neck even has a cute little collar with a plush bell attached to it. When you put this kigurumi on, you will find yourself equally prepared for a nap on the couch, or for a quick romp at the next costume party. If you do decide to take a nap, you’ll be the only sheep that you’ll need to count to get to sleep. Actually, you might even count yourself lucky. Why, you’ll be over the… fence about this costume!